Snake bites are not common in Australia, but cause severe effects and often occur in rural and regional parts of Australia. Antivenoms exist for the treatment of many of these bites and have been used for decades. However, there are still many questions about the effects of different snake venoms and toxins, the effectiveness of antivenom and other treatments, the safety of antivenom and the exact amount of antivenom that is required for treatment. ASP is a multicentre study that recruits snakebite cases from all over Australia, collecting clinical information, laboratory investigations and blood samples in all cases. The study measures venom and antivenom concentrations in every patient. The major aim of the study is to better define the clinical and laboratory effects of envenoming by different Australian snakes and the effect of antivenom on these as well as on venom measurements. In addition, a number of interventional studies are included in ASP (see below). The purpose of this project is to investigate the effectiveness and safety of early antivenom administration for the treatment of red-bellied black snake bites/envenoming. Red-bellied black snakebites are the most common in Eastern Australia and are not routinely treated with antivenom because they appear to cause minor effects and there is concern about the risk of allergic reactions to antivenom. However, recent work by the ASP investigators suggests that the early use of antivenom will reduce the chance of people developing muscle damage. 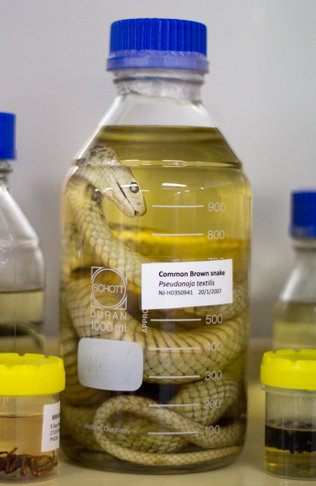 This study is a randomised controlled trial of one vial of tiger snake antivenom compared to standard care (placebo) and this will provide evidence for or against the early administration of antivenom for muscle damage. The study will also investigate whether antivenom neutralises other effects of RBBS envenoming and determine the frequency of allergic reactions, including anaphylaxis, after antivenom use. In addition to the benefits for Australian snakebite treatment, the results will have global implications because there remains little evidence based on controlled trials for the effectiveness of snake antivenom in general and in particular for muscle damage. Current standard practice for any snake bite requires laboratory testing to determine if a patient has been envenomed. The administration of antivenom is then based on the presence of clinical effects of envenoming and abnormal laboratory investigations. Many of these envenoming effects are irreversible, so once they develop they are unlikely to be reversed by antivenom. This means that, antivenom needs to be given prior to the development of irreversible envenoming syndromes. The aim of this project will be to administer antivenom early – as soon as the patient presents to hospital without first waiting for laboratory tests or the development of clinical signs of envenoming (except non-specific symptoms), and/or retrieval to a major hospital for laboratory testing. The objective is to determine if the administration of early antivenom will prevent envenoming effects and therefore significant morbidity or death.